pasta «Come Play In The Kitchen! Come Play In The Kitchen! Ok — so I am not always the amazing cook I like to think I am (GASP!). But. Some days I just want something quick and easy, that doesn’t mean I have spent absolutely forever in the kitchen. I mean, I like to play. But — who wants to always slave away in the kitchen when the sub-friggin freezing weather we’ve had has started to evolve into something resembling warm? I want to be out in the sun, at least a little. Plus, as far as cooking — it doesn’t help when your chef friend is elsewhere for the supper hour. (Oh how spoiled I have been!) 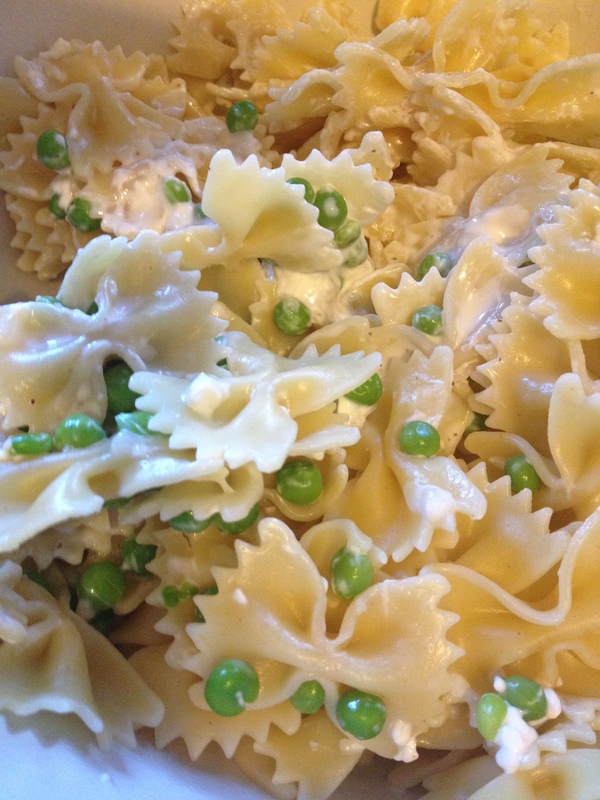 The amazing thing though is that my children still appreciate my cooking…Oh yeah baby!!! And — thank God! I love to cook and thoroughly enjoy being in my kitchen a large portion of the time. But I am no restaurant — My philosophy is that if you don’t like it, we always have an abundant supply of peanut butter and (yes, homemade) jelly…No one has ever complained (much) about the alternative anyway. And I’m still providing the “food” portion of the whole food/clothing/shelter stuff, so we’re good — no need to call Children & Youth on me. So last night was pasta night. It seems to be a “thing” on Mondays. Not only is it usually meatless, in keeping with the whole ‘Meatless Mondays’ movement (http://www.meatlessmonday.com/), but I find it to be fast and very simple, and — most importantly — a meal that stretches. Because I NEVER know who is coming for supper on a Monday. My oldest son has tons of friends who are members of the local fire department (which is really “local”…within obnoxious siren-hearing distance) and so over the years I’ve had many, many extras at my table on many a Monday. Usually my personal preference is a red tomato-based sauce, but let’s face it — some days monotony is absolutely BOR-ING! This past week I found a very simple cream cheese alfredo recipe that sounded pretty fool-proof, and it actually was pretty awesome. I can’t remember for the life of me where I found said recipe, so I apologize in advance for seemingly pilfering an amazing and tasteful dish. 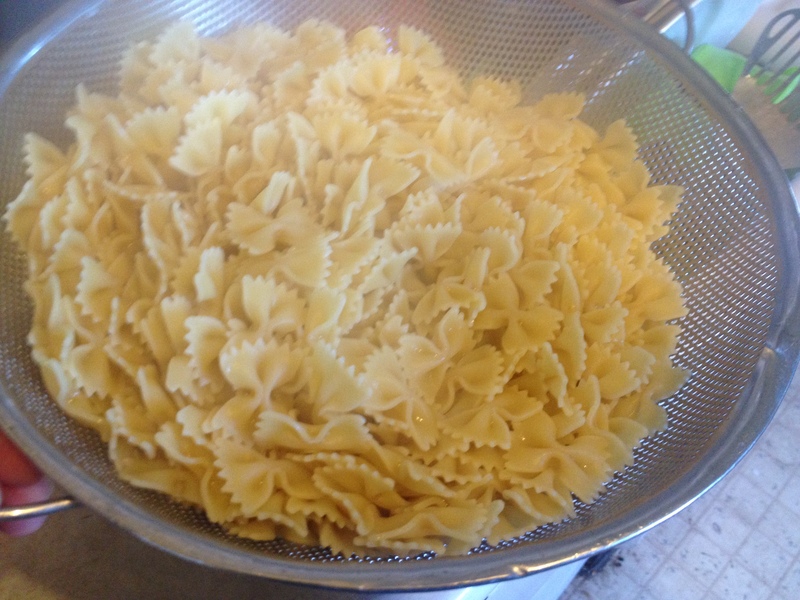 * I used two 1 lb packages of farfalle noodles that I bought on sale (yay me!!!). Boil according to pacakge directions. I like mynoodles al dente, but not everyone does…Some like them mushy and some like them almost raw. * In a saucepan heat 1 1/2 cups milk, 1 8-oz block of cream cheese and 1/2 cup grated Parmesan (do not skimp and buy the powdered stuff!!!) until the cream cheese is dissolved. This will take about 5 minutes. * Add 1/2 tsp salt and some fresh ground pepper. 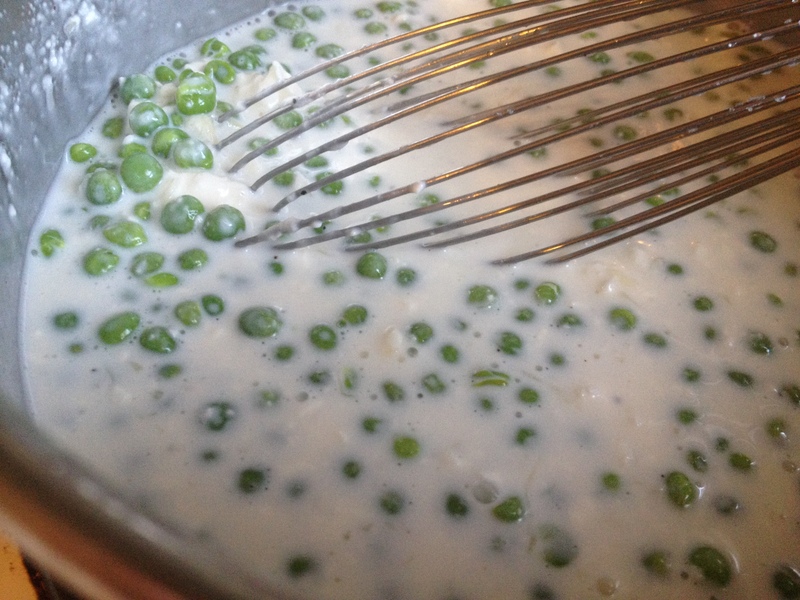 * Stir in 2 cups thawed frozen peas and immediately remove from heat. If you want to go crazy, maybe add some fresh herbs too (which I prefer this time of year when winter is giving way to some green…) This is one really rapidly pulled together and easy-peasy dish (no pun intended!). I hope you enjoy. Now go play in your kitchen!! !